Have you ever seen a more fabulously styled cat? 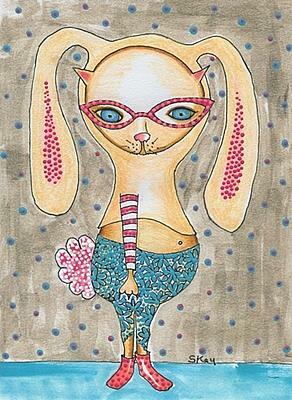 Those cute little blue flowery capri pants, stylish pink cat glasses and oh, those fabulous rabbit ears and that gorgeous fluffy tail! This a costume any cat would love to party in! Colorful mixed media illustration on archival paper. Ink, paint, pencils with gold glitter painted background. This is my January NFAC Nibblefest entry on Ebay where all art starts at just .99 cents and runs the 20th through the 27th of each month. This month's theme is "Costume Cat."